Here is the last post for my Enterprise, Alabama trip! 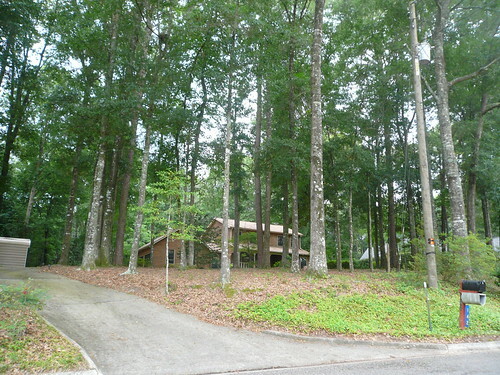 We visited Omi and Opi in Alabama between June 2-10, 2012. I've said it before on my blog but Omi is the best cook. 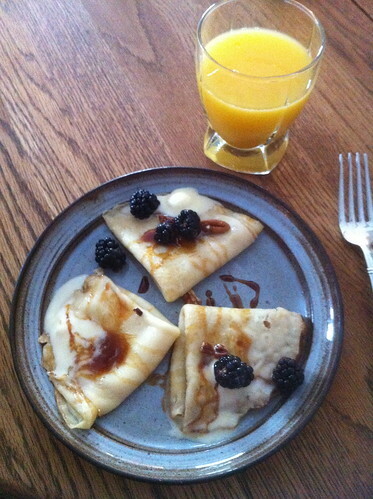 Here are some amazing crepes we ate one morning! In 2007, there was a bad tornado in Enterprise, Alabama. It wiped out many many homes and hit my mom's old high school. 8 high schoolers were killed and 1 adult. This made the national news and Enterprise, Alabama has received a lot of funding from the government. The high school they re-built looks like a really nice community college. I've never seen such a nice high school!!! My mom toured it last time she was in town and apparently they still give 'licks' which is shocking to me. I think that is insane and would not be okay sending my children there! "Do you think it is normal to give licks or do you think it is crazy? Because I've never heard of that or thought people didn't do that anymore!!!" They both thought it was normal!!! Anyways, just blows my mind! To be beaten with a paddle on the bum in class!!! 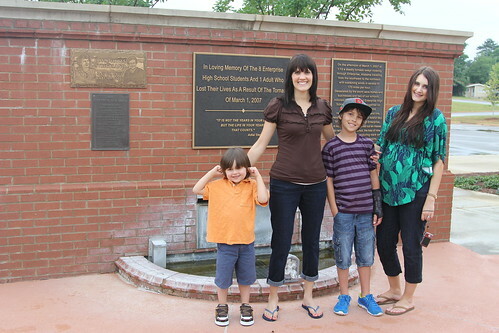 Here we were at the memorial outside of the old high school which was hit. 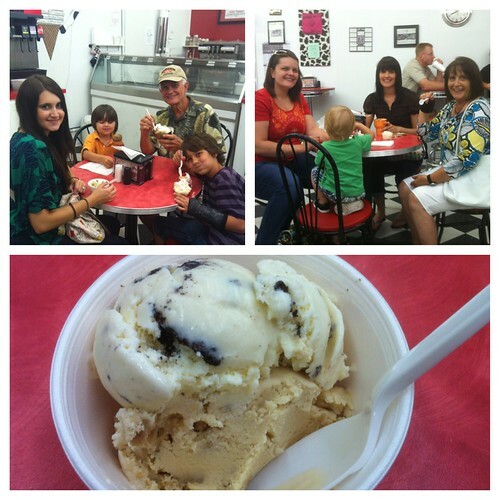 One evening we all ate at Milky Moos in downtown Enterprise. They had some pretty good ice-cream! 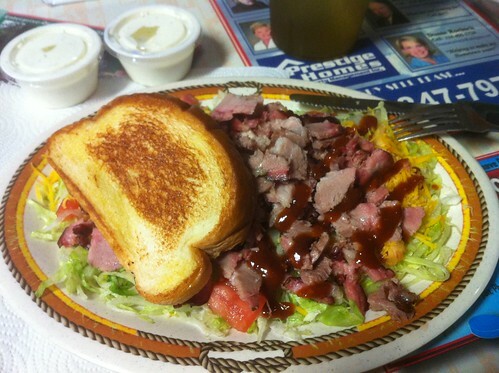 and I had the most amazing pork salad! Meanwhile, I started reading the book, Secrets of a Baby Whisperer. So far it is a good book, but honestly I haven't read any more of it after I came back to Colorado. I have a hard time making time to read! 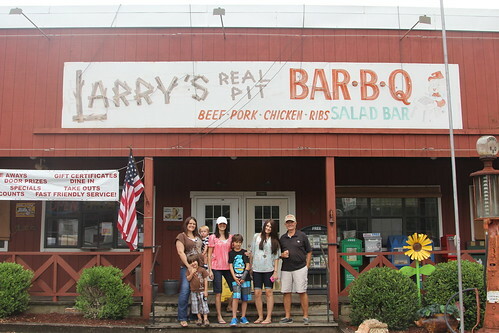 One evening we had the best.ribs.ever. 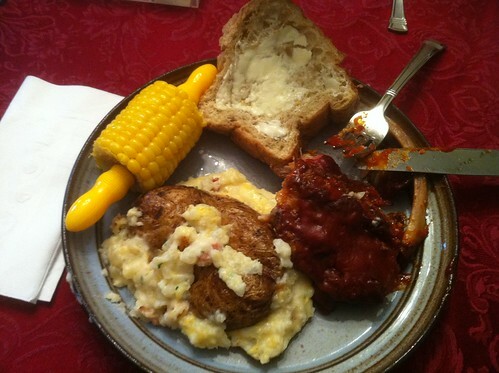 with a twice baked potato, corn on the cob, and soft bread. 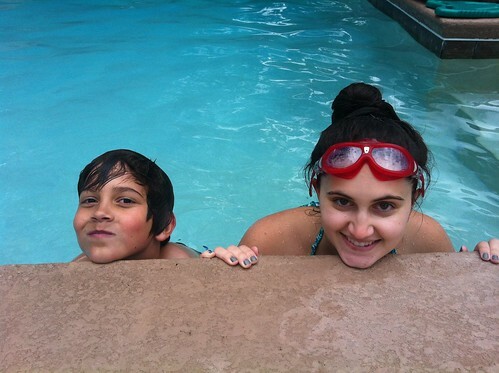 The whole week, when it wasn't raining as it was off and on, we hung out at their pool! Did you know they make waterproof casts now? Well they do! 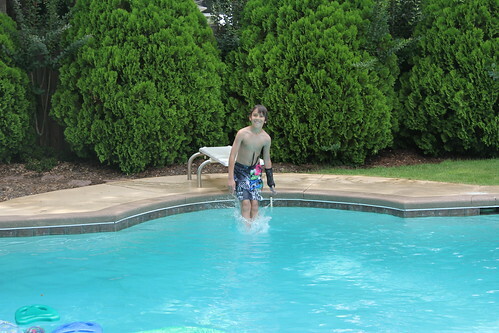 Hunter swam the whole week with a cast on his wrist! Kind of an interesting picture haha. I am not a good swimmer so Hunter and I hung out swimming laps and doing different strokes. It was a fun, brother-sister bonding time lol. I asked him for some tips and he wanted to get a picture of him 'being the teacher' and showing me a stroke haha. And yes, I wear goggles. I have contacts and if I get any water in them, my eyes feel like crap for the rest of the day and they kill!!! It is not worth it. Luckily I wore Hunters goggles and they kept the water out pretty well. 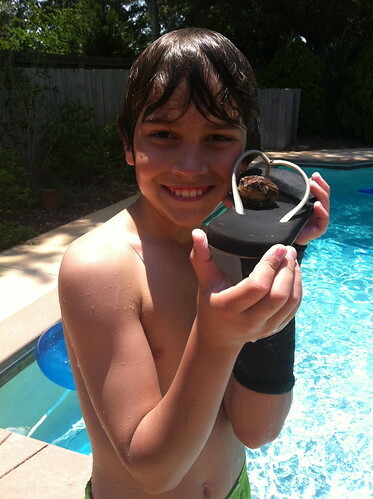 Opi and Hunter found a toad in 'the thing that catches debri that goes into the pool'...I definitely don't remember what that is called. Hunter named him Ronin haha and used my sandal to pick him up! One afternoon, Opi, Omi, my mom, and I drove around their old neighborhood, The Gateway. 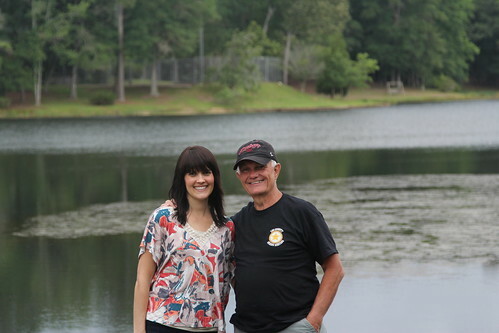 They lived in this neighborhood until their house burned down in the middle of the night. And yes, they were in it. They luckily escaped the fire but lost everything they had! 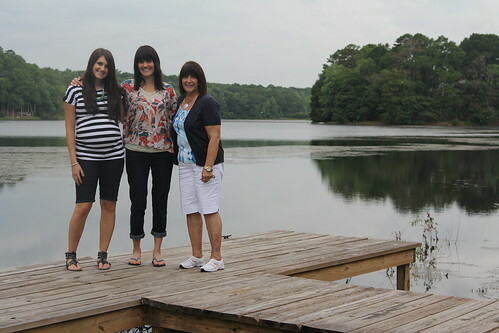 This is actually right where their house used to be! This lake was down the street from their house and I guess my mom would go swimming here with friends. 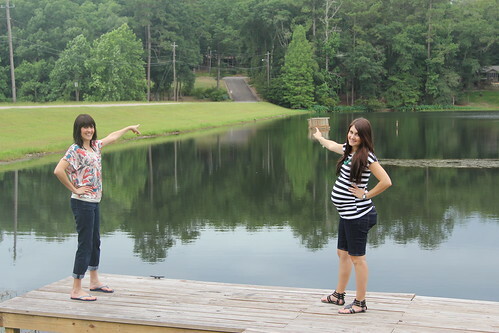 We are pointing to where their house used to be. My mom, me, and Omi. 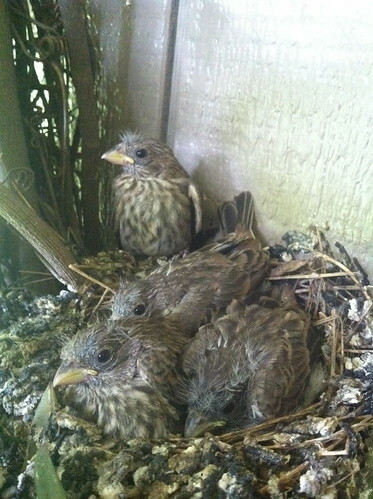 Slowly the birds in the nest (on their wreath) flew away...by the time we left they had all flown away! And Hunter got a real medal of honor! Well, this medal of honor belonged to one of Opi's friends, who passed away. Hunter was obsessed with it and kept begging Opi to have it and asking him what he could do to 'earn points' to get it, etc. I'm shocked but by the end of the trip Opi gave it to him haha! 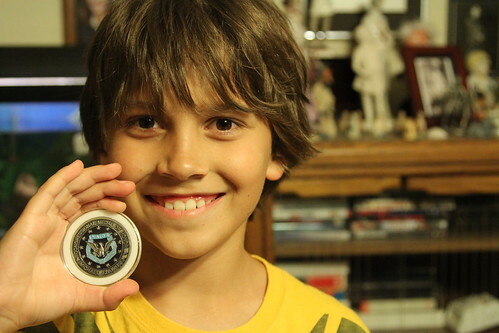 Hunter might be the youngest person to have a medal of honor! 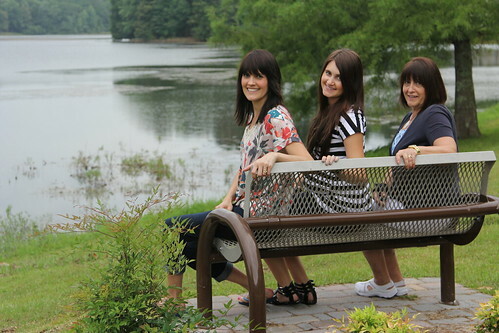 What a fun trip, and I must say your mom and grandma both look so young, I really thought she was your sister.... Looking so adorable! How fun - but I gotta say, that makes me feel super uncomfortable that licks are still happening today. What fun!!! Those crepes look amazing! Oh my gosh that food looks so good! Growing up in Alabama I never knew it was so strange to everyone else that we got paddlings. They aren't used often and in my opinion, they help A LOT. Just knowing you could get paddled keeps 90% of the students in line. I got a few of my own (including from my own aunt) and they are no joke!